Last year Brandon, Michael May, and I spent three days each talking about some of our favorite movies. 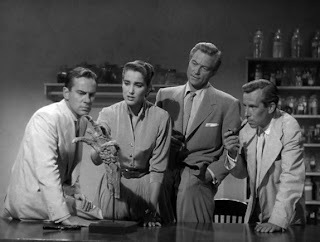 One of the movies I had talked about is Creature from the Black Lagoon. It is one of those rare movies that I like more every time I see it. My love for the movie is amplified even more because my wife and I started calling our house the Black Lagoon after we had a few months of pool trouble. The name stuck even after the pool was cleaned up. Factory Entertainment has just produced a prop replica that has me double checking my bank account. The company had already shown the Universal Monster line some love by producing a Frankenstein bust and replicating some of Dracula’s jewelry. 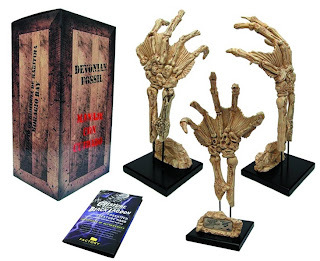 Their newest project is a replica of the fossilized hand featured in Creature from the Black Lagoon. It looks like an absolutely stunning piece, one that would look fantastic in my house, but it also comes with a 300 dollar price tag. So yeah, unless a winning lottery ticket someone appears in my pocket I don’t think I can justify this one. If you aren’t familiar with the Creature from the Black Lagoon you might not understand why I’d even want the hand. At the very beginning of the film the hand is unearthed. A group of scientists believe it could belong to one of the evolutionary missing links and decide to mount a full scale operation to unearth more. It’s because of the hand that anyone even goes to the Black Lagoon in the first place. Besides just looking cool, the hand is the catalyst for the whole movie.